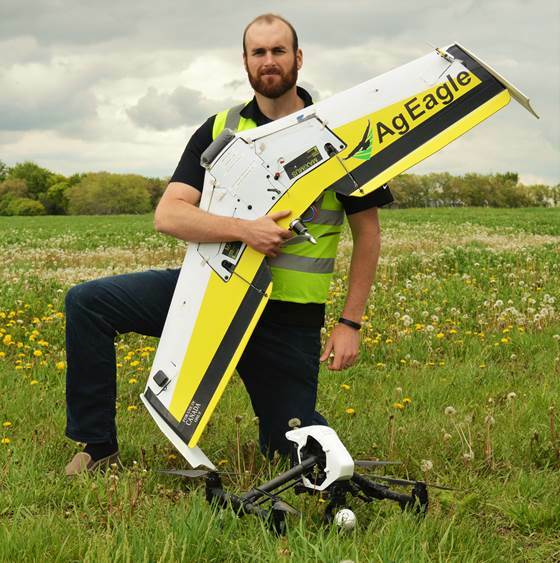 Matthew Johnson of M3 Aerial Productions will teach the new UAV Ground School course at Brandon University. BRANDON – Drones are taking off at Brandon University (BU) this fall. Students and members of the public who are fascinated by the unmanned aerial vehicles can register for a university-credit course that will teach them everything they need to know to safely and legally fly the popular and useful airborne vehicles. The new course, Applied Topics in Geography: UAV Ground School, offers students a novel opportunity to learn about drones, their applications, safety considerations, how they work, and the regulations and procedures to operate them. Students will have the chance to become certified drone pilots, able to fly drones commercially or for research at the university. “Drones have become a vital tool for collecting aerial photography used to generate land cover maps and create 3D models of the natural terrain and built landscape. They are used extensively across a variety of traditional academic disciplines including archaeology, environmental science, biology, geography, and geology; as well as in numerous applied fields such as architecture, civil engineering, surveying, and many more,” Wiseman said. The course will also prepare drone pilots for stiff new Transport Canada regulations. Existing rules exempt people who fly drones recreationally, while the proposed new rules will require everyone at the controls of a drone to have completed a ground school course like the one being offered at BU. To help meet expected wide demand for the training, the course will be fully available online. The first portion of the course is self-directed online study that must be completed by Nov. 17. The second portion includes three Saturday sessions (Nov. 18, 25, and Dec. 2) that are offered either in-class or through online videoconferencing. The course cost will be approximately $600 for visiting students and the general public; BU students will pay regular tuition fees. There is no prerequisite, and no need to already own a drone, as the course is completely ground-based with no actual flying. Johnson says people are realizing that drone education is necessary. With the ever-increasing popularity of drones, people need to be aware of the hazards before they start flying around overhead.